The tap&go service is a new element within jisp’s ecosystem, also developed by WaveAccess. jisp covers the customer’s entire journey using a web application integrated with NFC tags attached to products and iBeacons in stores (for sharing data on user behavior with the application), browser extension and mobile application (for communicating with tags and getting product features, special offers and reviews). Data on customers’ interests in online and offline space is collected in a real time mode and thoroughly analysed. As such, jisp makes business owners aware of what their potential customers are interested in with a view to deliver hyper-personalized offers. jisp reshapes the customer experience, providing truly interactive shopping: users can save goods on a list, study product details and share feedback, all while getting timely and personal offers and notifications. The tap&go function allows users to make purchases, bypassing checkout lines and avoiding having to pay by card or cash. And by avoiding scanning which has been widely rejected by UK shoppers there is no need to scan the barcode. The product is automatically added to the virtual shopping cart, its price and its description is immediately displayed on the screen. The number of selected items can be edited in the mobile app, where products can also be added to a shopping list. 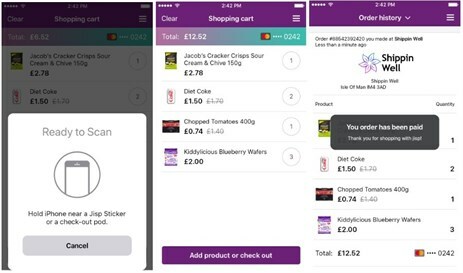 After the choice is confirmed, the user only needs to tap the phone against the checkout counter – payment is automatically debited from a pre-loaded card through the jispPAY feature. When purchasing age-restricted products, the app will ask the customer to wait for a store employee to verify their age. Retailers can mark any product as requiring additional verification upon purchase. 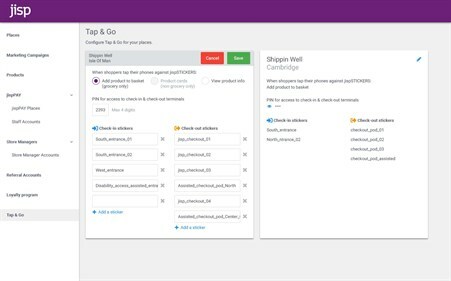 In the provision of client customisation tap&go aggregates data on product views, purchases, the order of selecting goods and accounts for any rejected items. Offers are customised with any client-based loyalty scheme included to ensure campaigns are uniquely relevant. The ability to inform customers about promotions via the app also eliminates the cost of distributing advertising brochures. With its simple-to-use retailer dashboard, retailers can update product information and pricing remotely and in a real time mode, along with analysing customer experience statistics. tap&go is easily deployed with fast integration into existing POS systems to correctly display information about transactions. NFC (Near-Field Communication) is employed to display product information on smartphones and support contactless payment. Short-range high-frequency communication technology allows data transfers between devices at a distance of around 10 cm. The list of NFC-enabled mobile devices includes most Android (Version 5.0 or later depending on the model) and iOS (iPhone 7 and later) smartphones and tablets. Real-time client-server communication is implemented using a SignalR web library. “For over 2 years jisp has been helping attract customers to shopping centers and High Street shops in the UK. Now we intend to make grocery shopping even easier with an experience for shoppers now commonplace in the online environment, where the store’s “owner” virtually knows each customer and understands what he/she is interested in, and when to make an offer. To this end, the WaveAccess team has developed an application that is simple to use whilst ‘under the hood’ is highly complex in its functionality. 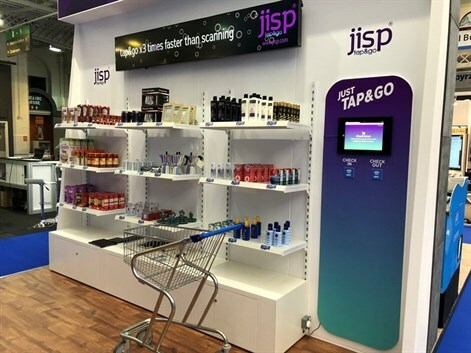 tap&go offers retailers versatility, user experience’ flexible management, and dynamic pricing”, Julian Fisher, jisp CEO & Founder. “The new generation of customers consumes content in a fundamentally different manner and prefers to do it through their smartphones. jisp provides these opportunities by building shopping lists, creating menus and recipes, evaluating goods, sharing information with other users, analysing food basket and related costs – and all of this made available through mobile phones. It makes shopping both convenient and interactive. tap&go is designed to shift focus from online shopping to offline outlets, and thus bring customers back to classic retail”, Alex Azarov, Senior VP of Engineering at WaveAccess. The tap&go shopping app is being introduced in UK grocery stores, drug stores, gift shops, and outlets selling electronics, jewelry, clothes, etc. Would you like to learn more about solutions for retail and E-commerce by WaveAccess? We will be happy to share our experience! We are recognized as a top Internet of Things Company on DesignRush!